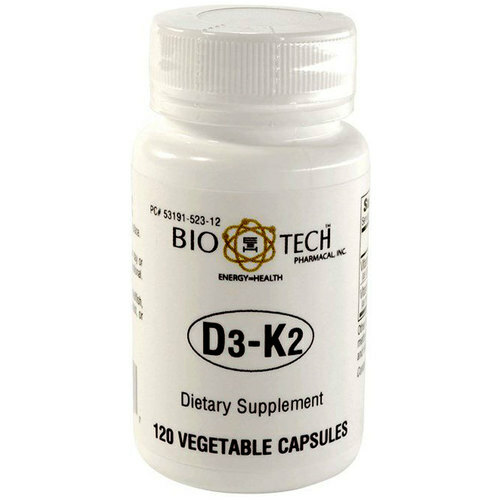 BioTech Pharmacal D3 Plus offers doses of both Vitamin D3 and K2. Warnings: Keep out of reach of children. Safety sealed or your protection. Store tightly closed in a cool, dry place. Notes: Dairy Free. Egg Free. Soy Free. Fish Free. Shellfish Free. Nuts Free. Wheat Free. Gluten Free. Sugar Free. Yeast Free. Artificial Colors Free. Recommended Use: One capsule per day or as directed. Individuals taking blood-thinning medications should consult a healthcare professional. The customer reviews posted below are based on individual consumer experiences and may NOT necessarily represent what expected results will be from using or taking BioTech Pharmacal D3-K2 - 120 Vegetable Capsules. These results may not be typical and you should not necessarily expect to receive the same results. Actual results may vary. Good amount of vitamin K2. It keeps vitamin D levels high. The price a bit high.